You are browsing the archive for Roadmap. To establish a steering group and advisory board to oversee the project and represent the growing number of stakeholders. To establish specific groups or teams to look after specific areas; in particular, a “technical group” to oversee technical development and a “content and outreach group” to oversee materials (including project website) and to drive community and user engagement. To establish a membership model for stakeholders to support the long-term sustainability of the project. The project will still have its formal institutional home at the Open Knowledge Foundation, and enjoy support and participation from our CKAN team. But it will be autonomous and will have its own independent governance, from a board drawn from major CKAN stakeholders. The Open Knowledge Foundation will continue to contribute at all levels, but this approach will allow others – from government users to suppliers of CKAN services – to have a formal role in the future development and direction of CKAN. Over the next couple of weeks we will be introducing a new structure for development (how to become a core contributor etc) and governance (steering committee and supporting ckan.org as a member) and we would love to hear your ideas and feedback. Please either get in touch or place ideas in this open project ckan document and watch this space for more posts soon! Now that CKAN 2.0 is out, what should the next direction be for CKAN? New features, easier customisation, more data previews, UI tweaks… we’ve had plenty of ideas and suggestions, and we’d like you, the CKAN community, to help shape the direction and future of CKAN. Prioritise features: see something you want? Vote it up (by clicking on the card and pressing the ‘vote’ button)! Specify implementation: comment on a feature card with requirements, edge cases to consider or related work that exists. Contribute code: Are you a coder working on something like one of these features? Let us know! Add a comment to the card, and e-mail the dev list. Sponsor: See a feature listed you’d really like in CKAN, but don’t have the skills to implement yourself? You can sponsor the feature by paying for the developer time needed to create it. Just, write to info[at]ckan.org or using our contact form. Suggest: Is there some great feature that you can’t see on the roadmap? Add it to our github wiki page and kickstart a discussion on the discussion list. Ideas / requests: there are lots of ideas that have been put forward. Which of them would you find most valuable? 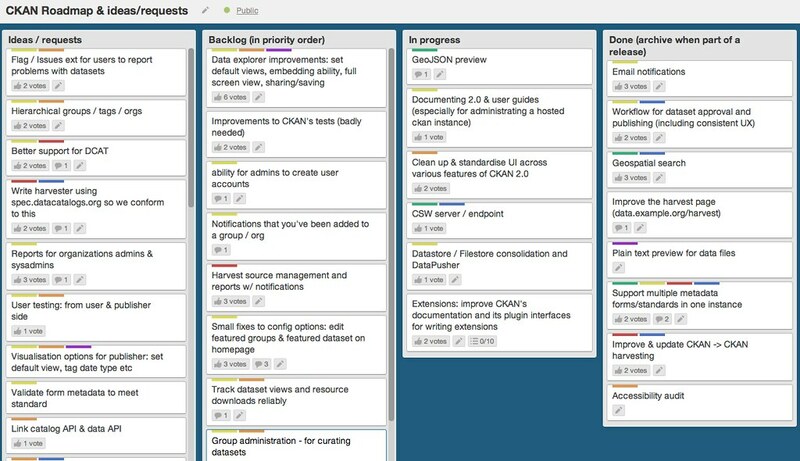 Backlog: These are things we plan to work on, but haven’t started yet. In progress: Stuff our developers are working on at the moment. Done: These are features that have recently been developed and will appear in a release of CKAN soon. Click on a card to see more details. For actual bugs and issues, it is still best to report them on our github issue tracker. For general Q&A please use stackoverflow or drop a note to our open community dev list.